The accuracy of correlation-based image registration (CBIR) in the analysis of pressure-sensitive paints (PSP) was investigated. CBIR has been developed to perform accurate image registration without the need for control points, even for model motions containing nonlinear local deformations. 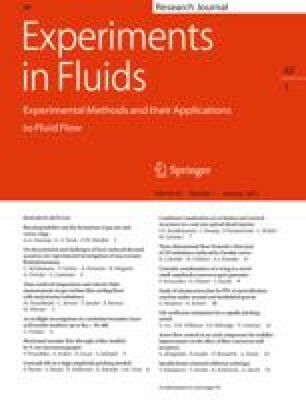 In the present study, the influence of displacement errors and their sensitivity on the accuracy of pressure measurement was examined by uncertainty analysis. The error sources in image registration were classified and several factors affecting the accuracy of image registration were examined. The performances of image registration were evaluated under several artificial model motions. Local intensity variations due to speckles, which enhance the image correlation in CBIR, may act as a source of image noise. The local pressure sensitivity in the presence and absence of speckles was investigated through pixel-by-pixel calibration. A spatial filtering was employed to reduce the local intensity variations. It was found that application of a median filter decreased the fluctuations in the local pressure sensitivity and significantly reduced the sensitivity of the intensity error to misregistration. An erratum to this article is available at http://dx.doi.org/10.1007/s00348-006-0119-8.